In the 1850s the town of La Grange was a trading center for the many gold prospectors in the area. At the peak of the Gold Rush, the town had a population of about 5000 residents. A ferry was located in La Grange across the Tuolumne River, which was operated by Nathan McFarland and later by Anthony McMillan. In the 1880s a bridge was built at the site. The current bridge was built in 1914, but instead of being named the McMillan Ferry Bridge it was simply called the La Grange Bridge. Similar to the Old Basso Bridge, the Old La Grange Bridge was retired from service when the new State Route 132 Bridge was built to the north across the Tuolumne River in 1987. 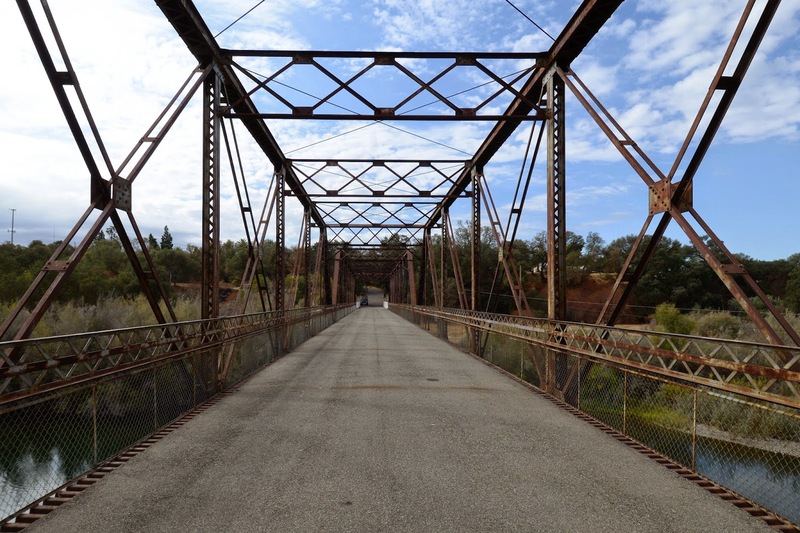 Instead of a long Pennsylvania truss span like the Old Basso Bridge, the Old La Grange Bridge has two Pratt truss spans over the Tuolumne River and trestle spans for the approaches. The bridge is 552 ft long (making it much longer than the Old Basso Bridge) with two 162 ft long truss spans (similar to the generic drawing above). Stanislaus County, California Bridges: Old La Grange Bridge across the Tuolumne River by Mark Yashinsky is licensed under a Creative Commons Attribution-NonCommercial-NoDerivatives 4.0 International License.